Today we fished in a mini cold front and the Stripers were balled up very tight. I would have thought this was a school of bait but we were fishing and had down lines out when 4 or 5 of them buried into the water. It wasn't till I looked at my side scan that I realized that they were Stripers and as I told the guys to get ready the rods bent over. Notice I was using 200 khz on the sonar screen. This was a Lowrance HDS 12 screen shot. 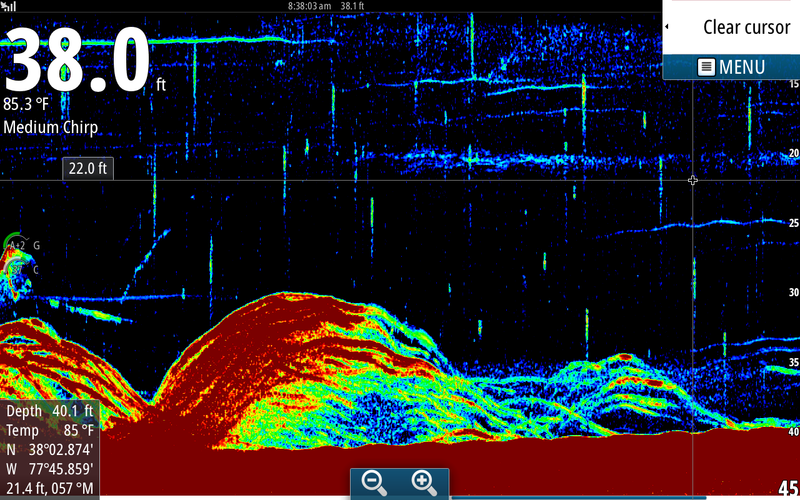 This is the same school taken on my Simrad about 30 seconds later than the Lowrance shot. This is a good example of what Chirp can do for you. 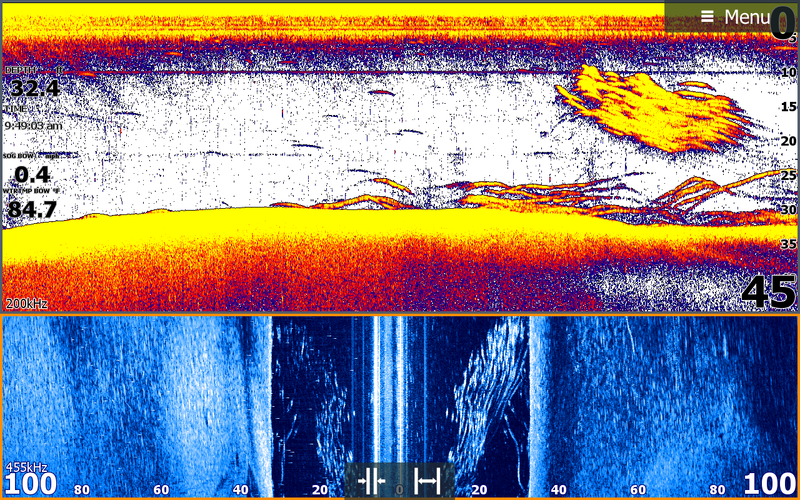 Again using traditional 200 khz in the Lowrance shot above the fish were stacked so tight I would have thought it was baitfish. But with Chirp it's target separation has much more detail and picks up individual fish much better. You can clearly see each Striper on the left side of the screen. 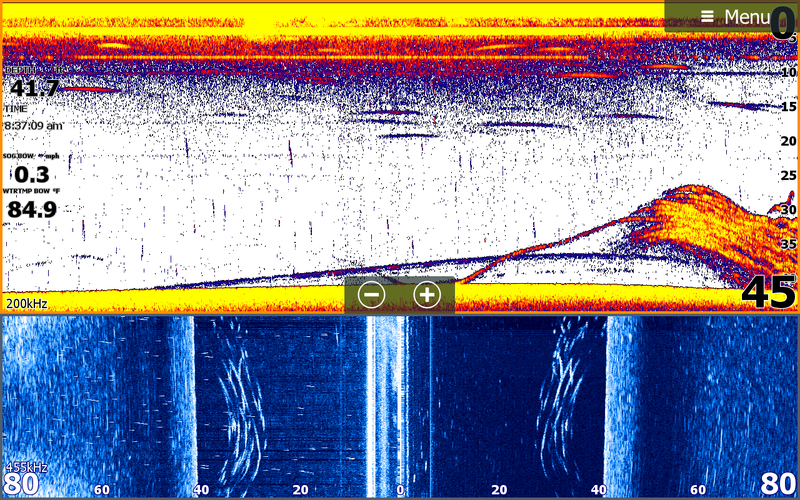 Both Lowrance and Simrad can run on different sonar frequencies, I just happened to have Chirp on my Simrad today. This is a shot where I was working a contour using my Navionics map. It is so much easier to keep on a contour when it is highlighted. In this screen shot 10 inch Stripers were occasionally breaking around the boat but larger Stripers were near the bottom. 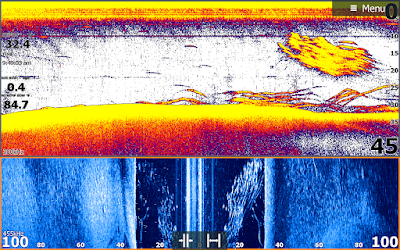 The cloud on the right side of the sonar screen is the school of punks and the arches near the bottom are keeper Stripers. Side scan also verifies the size of the punks [small vertical dashes clumped tightly together] with an occasional larger Striper below them. 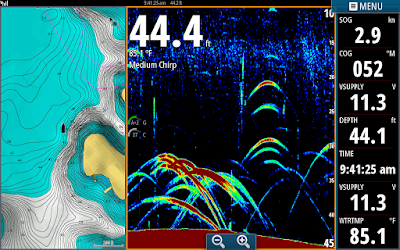 The boat is located on the top of the side scan page at 0 and the darker blue is the water column. 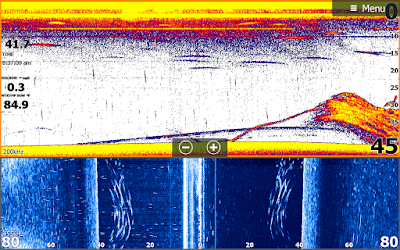 The white vertical line at 32 feet out to both sides is the bottom and the light blue from 32 to 100 feet out both sides is side scan looking out away from the boat up to 100 feet which is the distance I had my scan set at. The closer to the 0 line is higher in the water column and right where the two colors converge is just off the bottom. Looking at both the sonar and the structure pages you can clearly see what I am trying to explain.